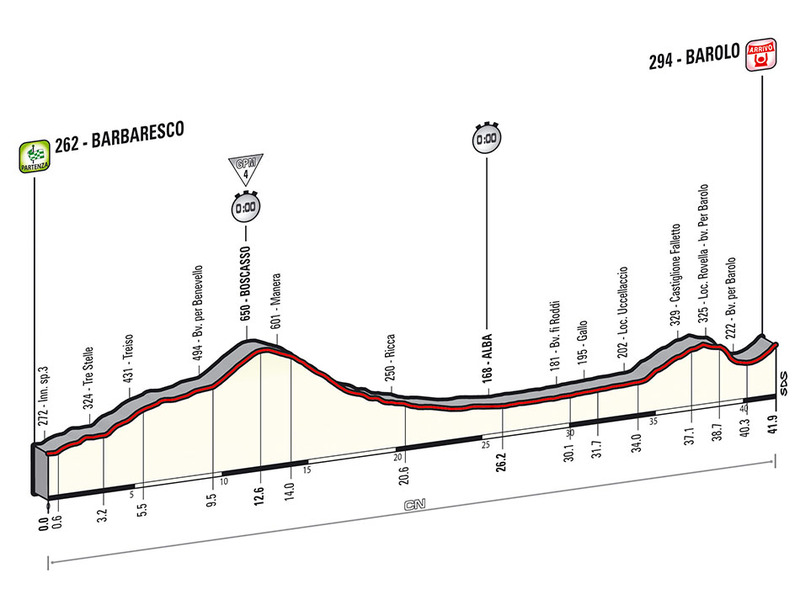 Unusually for the Giro, we have to wait until stage 12 for the first full-blown GC stage. Up until now, only medium mountain stages, the team time trial and time bonuses will have affected the GC, but races against the clock as long as today’s are guaranteed to shuffle the pack and grant us a slightly clearer picture of who are the race’s main protagonists. This was certainly the case in last year’s equivalent stage, a 55km time trial that, similarly, occurred before any serious mountains had been climbed. Vincenzo Nibali took the jersey that day and would not give it up for the rest of the race; Cadel Evans moved into a podium position, and Rigoberto Uran, Michele Scarponi and Przemyslaw Niemiec’s moves up the classification ensured that the top 10 at the end of the time trial included six of the riders who would finish in the overall top 10. Although a category-four climb has been included — in the form of the Boscasso — the climbing specialists are likely to lose a lot of time. So much so that, by the end of the day, the likes of Joaquim Rodriguez could already be out of contention. The start and finish are both in the Piedmont region, famous for its wine. In fact, Barbaresco and Barolo are the name of two reds, both made from the local Nebbiolo grape. Known as the ‘king of wines’ the Barolo in particular has a considerable reputation — expect an acidic, tannic taste.